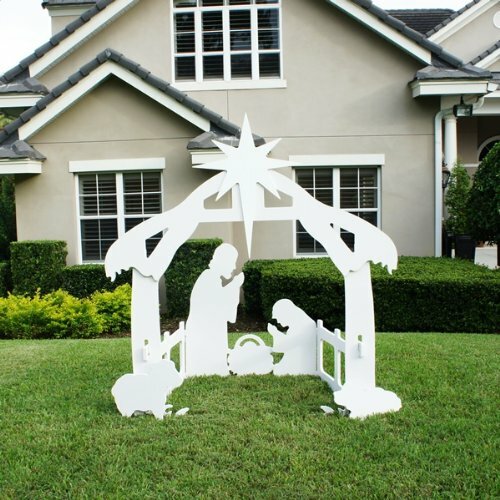 Large Christmas Outdoor Nativity Scene. Measures 72" tall x 67" wide x 40" deep. Designed for large yards & churches. Looks great in any yard without looking overly commercial. Includes powder coated bracing on back to ensure stability even in the harshest of winter weather. Composed of marine grade plastic designed to last many years. The entire set breaks down to store in (2) compact boxes each measuring 45" x 30" x 3". Entire set breaks down to store in 2 compact boxes 45" x 30" x 3"
If you have any questions about this product by Teak Isle, contact us by completing and submitting the form below. If you are looking for a specif part number, please include it with your message.